This trip ran for four nights at each of the two camps. The trip was led by accomplished wildlife photographer Andy Biggs. Throughout the trip, we concentrated on maximizing good photographic opportunities. We also worked with participants on image processing in the midday and evening rest periods. James Weis and I assisted Andy as photo tour leaders, and we made use of three game drive vehicles. At Chitabe one morning we found a pair of male lions on the move, and managed to photograph them as they came to rest at a pan in the woodland. These particular male lions are fully mature, large, and with dark manes they make for great photo subjects. One of the most powerful moments on the whole trip took place when they both roared whilst our vehicles were parked close by. The sound of male lions roaring at close range is one of the most awe-inspiring sounds in nature. We next came across two sub-adult cheetah, a male and a female, as they moved through some open woodland. The two cheetah stalked some impala, but never launched any form of attack and we left them after they went to sleep under a tree. We enjoyed photographing a playful troop of baboons. They were moving from one jackalberry tree to another, and gorging themselves on the ripe fruit. Impala and kudu antelope were following the baboons, and picking up bits of jackalberry fruits that had been discarded by the baboons. When we made a late afternoon visit to an active hyena den, two young hyenas came out of their den and walked around our vehicles, as curious about us as we were about them. After following a flight of vultures to the site of a recent kill, we located a female leopard with a full belly. We had excellent sightings of the leopard over a two day period, culminating with the cat climbing onto a horizontal tree branch one evening as the sun turned the sky bright pink behind it. Next we spent four nights at Savuti camp. Over that time we had many good sightings. A pair of female lions feeding on a giraffe was one of them. One morning we came across a pack of three wild dogs. They hunted an impala, but the chase was so fast that we lost sight of them. By the time we caught up, the dogs had chased an impala into the water of the Savute channel and killed it there, dragging it onto an island to feed. One dog took a while to find its’ fellow pack members, and gave us good chances to take pictures as she ran up and down along the edge of the channel. The dogs swam back towards us through the channel. We spent an hour with the long-time resident male leopard as he patrolled his territory, scent-marking, calling and climbing a tree. We also spent a short time watching a shy female leopard hunt warthogs unsuccessfully. 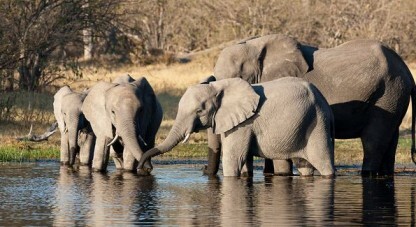 Elephant viewing was phenomenal at Savuti. 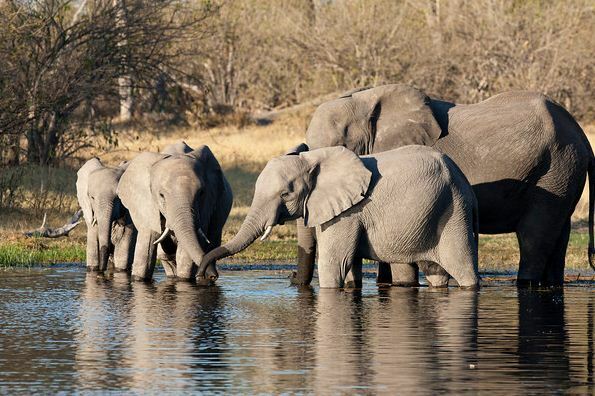 Each day, herds of elephants would come out of the woodland to drink from the water of the channel. They would play in the water, dust-bathe and socialize in the open. We spent much time just watching these interesting animals as they went about their business. We had two excellent sightings of female lions along the channel. One adult lioness was with her two sub-adult male cubs, resting. When they spotted some kudu on the opposite bank of the channel, the lioness slipped silently through the water. However, the young males took to the water at top speed, making for a spectacular crossing but not assisting their mother’s hunting effort at all. The other sighting took place when we followed a solitary lioness moving along the north bank of the river, and she was calling to try and locate her two cubs. Eventually, she located the cubs on the opposite bank of the river. She tried to get them to cross over, but the cubs wouldn’t do it, so eventually the lioness entered the deep water, and crossed over to her cubs. The cubs were so happy to be reunited with their mother, and it was a great way for an afternoon of wildlife viewing to come to an end.